Blythe design co created this space as a personal sanctuary from our busy city lives and a place to recharge in a truly gorgeous cabin with the wilds of West Marin just outside our doorstep. 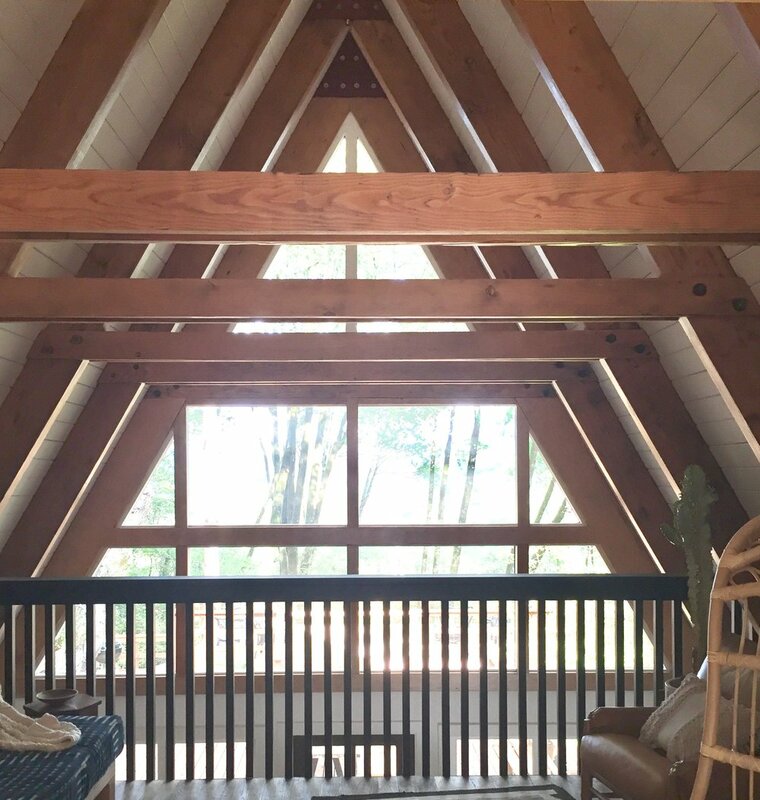 The A- Frame and surrounding property are the ideal locale for an intimate celebration, writer’s retreats, creative workshops, adventuring, or reading by the fire. This Bohemian Modern A- Frame is a two bed two bath spacious cabin located in Northern California in beautiful West Marin county. The cabin works well for a group of friends, two couples, or small families. Commune with nature, connect with loved ones or gift yourself a personal retreat with a view amongst a forested acre of bay trees, redwoods, and mature oaks. We are located between the quaint towns of Point Reyes, Inverness and Olema minutes from the wild wonders of Tomales Bay. The A-Frame is a sanctuary for all to rest, recharge and create. Designed with a 'slow' pace in mind, our hope is that you enjoy every part of your stay; from making breakfast in our open kitchen, to choosing the perfect record to put on as the sun sets, or relaxing on the deck in the heated seats under a moonlit sky. When the weather turns enjoy watching the storm pass over black mountain cozy by the fire with a hot drink in hand. Blythe is an Interior Designer and Art Therapist living in California. Born and raised in New York City; she left at 17 for the wilds of the West Coast and now splits her time between San Francisco and West Marin. Blythe feels at home both on a cobblestoned city street at sunrise and a forested trail at dusk as the moon comes up. Through her deep understanding of both emotional and physical landscapes, Blythe helps her clients find a sense of home both within themselves and in the rooms they inhabit. The inverness a-frame is her latest project with blythe design co and the one closest to her heart.. When not working with design and therapy clients you will likely find Blythe dancing in her kitchen or getting muddy in the Wild.